Last year, the Rays began with an opening-day payroll of around $76 million, which was among the lowest in baseball. That’s hardly unusual for the organization, but then the Rays went and won 90 games, which was the tenth-highest total. They finished with the 11th-best Pythagorean record, and they finished with the fifth-best BaseRuns record. The A’s won more games, and they had the lower initial payroll, but the Rays were a massive overachiever. And this is just the half of it. After the season, the Rays lost Carlos Gomez and Sergio Romo to free agency. They designated C.J. Cron for assignment, and they swapped Mallex Smith (and more) for Mike Zunino (and more). Waking up this morning, the Rays had everyone they needed to field a young and competitive ballclub, and according to Cot’s, they had a projected opening-day payroll of…around $36 million. That’s lower than the Expos’ opening-day payroll in 2004. A team not spending isn’t a good thing, by any means, but it’s incredible the Rays have gotten to this point, considering what other teams do with more money. You could’ve fit the Giants’ entire payroll between the Rays’ projected payroll and the competitive-balance-tax threshold. The Rays haven’t been content to stay as they were. Rather, this put them in the unusual position of being able to make a splash or two in the market. They were reportedly in the mix for Paul Goldschmidt. They seemed like a fit for Josh Donaldson. They’ve been connected to Nelson Cruz. And on Wednesday, they’ve signed Charlie Morton. They’ve given Charlie Morton two years, and $30 million. The Rays don’t often get to do this, but they found themselves surprisingly flexible, as they try to mount a push for the playoffs. You might say the Rays face baseball’s greatest disadvantage, given that they share a division with the Yankees and the Red Sox. But when you’re ready to win, you’re ready to win, and BaseRuns says the 2018 Rays were right there. The existing team was already good. No one stands to become a free agent over the next two years. The Rays have what’s probably a top-five farm system. Morton is a perfect fit for where the Rays are — he’s a clear improvement, but he also agreed to a short-term guarantee, as the Rays won’t remain so flexible forever. Cheap, young players eventually turn into expensive, older players. Now is when the team has the most money to play with, and Morton should slot in as a quality No. 2 starter behind Blake Snell. I don’t know how much about Morton is worth going over. He’s 35 years old, and he was just named an All-Star. He closed out Game 7 of the 2017 World Series. For a time, he entertained the thought of just announcing his retirement after finishing his contract with the Astros, but then he decided to stick around. His medical record is riddled with injuries and stints on the disabled list, but he did just make a career-high 30 starts. And between 2015 and 2016, Morton decided to start throwing hard. Against righties, Morton hasn’t really moved. 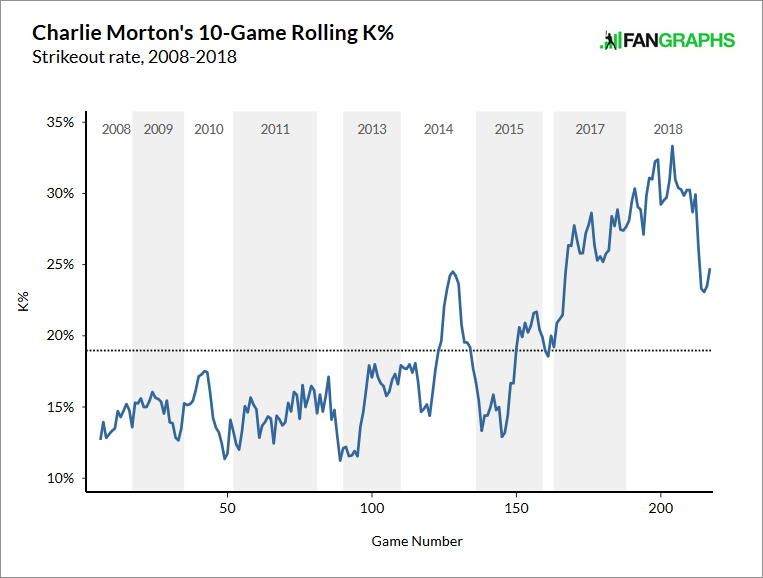 Against lefties, Morton’s K-BB% has tripled. He’s actually become better against lefties than righties, which would’ve seemed impossible five years ago. Morton knows his curveball is a weapon, and he’s leaned on it, like the Astros like to preach. Using a four-seam fastball more often has also played a role in that. The Rays have said their intent is to stick with the opener moving forward. But they can’t use the opener 60 – 80% of the time, so Morton fits here as a “conventional” starter, behind Snell. The assumption is that Tyler Glasnow will also be treated as a conventional starter. And then arms like Ryan Yarbrough, Jalen Beeks, Yonny Chirinos, Wilmer Font, and Jake Faria profile as the potential bulk guys. Top prospect Brent Honeywell should be recovered from Tommy John surgery somewhere around June, so that’s more talented depth. Jose De Leon ought to be on a similar timeline. The Rays aren’t hurting for major-league arms, and because of all of their flexibility and versatility, they should be able to avoid running Morton into the ground. And they should be able to back off of him in the event that something starts to bark. That’s the obvious risk here. That’s the obvious risk with any pitcher, but it’s especially so in Morton’s case. The Rays haven’t pulled off some genius, under-the-radar free-agent signing. The Rays have pulled off a *regular* free-agent signing, and that’s what’s notable for them. If Morton is healthy, he’s going to be good. If Morton is not healthy, he’s not going to be good. The Rays feel sufficiently confident, and these last two years, Morton has been able to make 55 regular-season starts. But the risk is considerable. Morton’s had an oblique strain. He’s had shoulder fatigue. He’s had hip surgery. He’s had elbow surgery. He’s had hamstring surgery. He’s had a sports hernia. He’s had a strained lat. If you look at the earlier images, late last year Morton had a little performance and velocity dip, after experiencing some shoulder discomfort. Maybe that’s gotten all better with rest, but bear in mind the Astros decided against extending a qualifying offer, worth $17.9 million. They did make that offer to Dallas Keuchel. Granted, they didn’t extend an offer to Marwin Gonzalez, either, so it might not mean anything. The Rays have worked to somewhat protect themselves. The deal also includes a third-year option that could be as low as $1 million if Morton misses significant time over the first two years because of injury and could be worth as much as $15 million if he remains healthy. I don’t have any more details yet. Some years ago, John Lackey agreed to a contract containing language that somewhat protected the team from an elbow injury. Felix Hernandez was given a similar clause. Cole Hamels‘ existing contract contains language referring to a shoulder or an elbow injury. 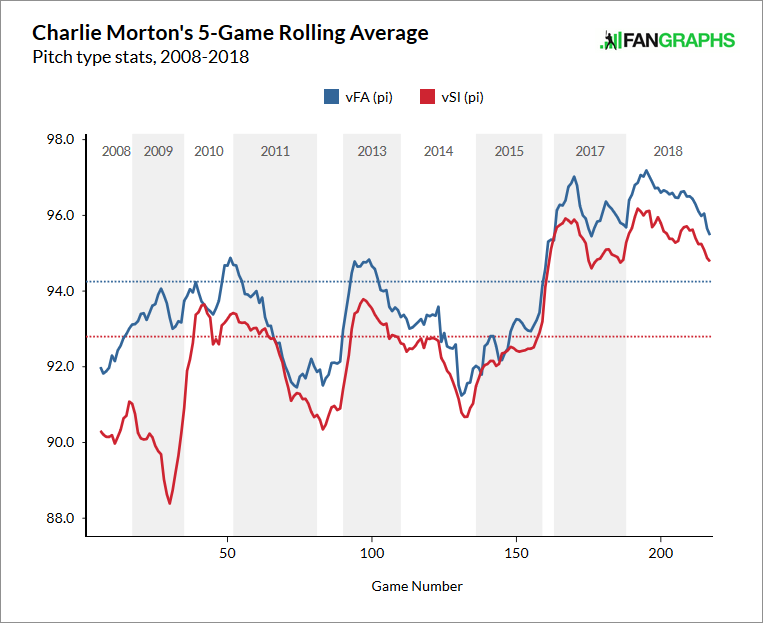 If Morton gets hurt, then, down the road, the Rays might get to keep a cheap Charlie Morton, but they’re looking for him to perform in 2019 and 2020. Injuries might be the very worst thing about baseball, and there’s only so much the Rays can conceivably do to keep Morton healthy and on the field. The injury potential is real. Morton is only getting older, and, because of how little the Rays tend to spend, $15 million a year means more to them than it would to the Red Sox. If Morton ends up sidelined for a while, no one could be rightly surprised, and the Rays might look back at this as a missed opportunity to spend on someone more dependable. They only get to make moves like this so many times. They need to win most of their gambles. But everyone’s some level of injury risk. Morton has started 55 games the past two seasons, and he’s pitched into the playoffs. By and large, he’s been effective, posting 6.3 WAR, and this is a chance for the Rays to push forward. They can afford to make another splash as well, if they so choose, and they’re going to try to narrow the gap between themselves and their AL East rivals. The Rays have a little chance here to throw some money around. It’s a chance to act like a more normal baseball team. Signing Charlie Morton is the act of a normal baseball team. It certainly worked out for the last team that did this. We hoped you liked reading The Rays Made an Actual Free-Agent Splash by Jeff Sullivan! Hey, a good player signed a deal for a cheap price! I think the Rays know that it is going to be hard to repeat what they did last year–what they did last year was incredible, but it’s hard to run platoons at all those infield spots AND carry all those pitchers to bullpen games AND have all those relievers and infielders overachieve. Charlie Morton wouldn’t be an inning-eater for any other team, but his 167 innings last year would have put him 2nd in innings behind Snell. I like it. I still don’t think they’re in a good spot because of the Yankees and Red Sox, but if they can’t spend the money on extensions for the young guys this is about the next best thing they could do. I really like this move too. I agree mostly, but as it stands their oldest regular will be Tommy Pham at 30. They could over-achieve, but some could also mature into good players. The Rays continue to be fascinating. Which infielders were platooned? Better yet, which infielders still on the team were platooned last year?